I don't know about you, but I thought this season was supposed to be spring into summer! 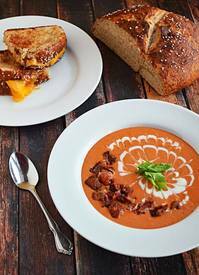 It's been cold here in New England and the best thing to warm me up is this Bacon tomato bisque! It's like tomato soup but better- um, Bacon! The soup is pretty simple to make, so you can whip it up regardless of your kitchen experience. Also, it’s really easy to make those cool designs in the soup, so you can impress everyone you serve it to. Top it off with a sprinkle of Bacon and some celery leaves and it looks like something you’d get at a restaurant!